MP Megan Leslie, member of Canadian Parliament and the Deputy Leader of the New Democratic Party, came under attack for her community events web page, which included a mention of AE911Truth and Richard Gage, specifically his lecture in HalifaxSince the advent of the first ReThink911 campaign last fall, there has been a sea change in the media’s response to skepticism about the official account of 9/11. CBC in Prince George interviewed event coordinator Bev Collins, followed by Victoria's leading radio station, CFAX1070, hosting local engineer Werner Simbeck and Gage tour organizer David Long for 25 minutes. The Vancouver event was very well covered in two issues of the popular alternative monthly Common Ground, and in Canada's largest urban weekly, the Georgia Straight. In Winnipeg CKUW 95.9 FM discussed a breakthrough in 9/11 evidence in 2014, and Toronto`s largest newspaper, the Toronto Star, covered the ReThink911 video ads in the Toronto subway showing the collapse of WTC7 – reporting the group's belief in controlled demolition as the cause. Further objective coverage of the subway ads titled "Controlled demolition?" appeared in Toronto Life, popular Newstalk 1010, and Conscious Life News. Mainstream Global TV News Hour gave 30 seconds of matter-of-fact coverage to the subway ads the day before Gage spoke in Toronto. Montreal`s CJAD 800 AM`s Tommy Schnurmacher provided investigative reporting of the evidence, and Montreal.tv advertized the McGill multimedia presentation, and included a segment from the 2012 PBS hit, "9/11 Explosive Evidence: Experts Speak Out." Newfoundland's VOCM Backtalk held a lively interview with Gage as well. However, the National Post's "truther" antagonist Jonathan Kay did one of his classic ad hominem numbers on Gage`s multimedia presentation. His long and silly article attracted over 700 (mostly adverse) comments – which suddenly closed down when the 23-member academic 9/11 Consensus Panel tried twice to post one of its peer-reviewed Consensus Points. (Screenshots show the comments disappeared within minutes.) The Consensus Panel, co-founded by Nobel nominee David Ray Griffin and supported by the most famous judge in Italy and the longest sitting member of British Parliament, clearly threatened Kay's vacuity. Judging by Twitter comments, Kay's soul-mate Michael Coren of Sun News may well be regretting the bullying tactics and cosy condescension he heaped on the "loony" Gage crowd in Toronto. 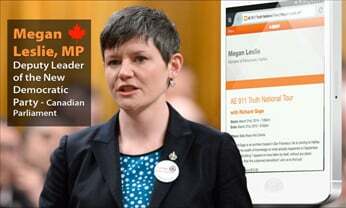 But more objectively, Ottawa`s CFRA 580 AM had Gage on its Sunday Morning Blend and also reported the Conservative backbencher attack on MP Megan Leslie, whose community events web page had included a mention of the Gage lecture in Halifax. The story blew up into a media/Twitter storm covered by CBC (where sanity prevailed when the network updated its first sensational story by reporting Ms. Leslie's defense of her right to free speech from "partisan trolls"), HuffPost, CTV, and Radio Canada. On balance, thanks to the continued hard work of thousands of activists along with AE911Truth and the ReThink911 campaign, the media increasingly allows 9/11 concerns to be seriously aired without ridiculing the messenger.